Whether you’re new to the sport or looking to advance your skills, our instructors have you covered! Lesson reservations are first-come first-serve and are strongly recommended. Sign up 24 hours in advance at 608-437-4135. 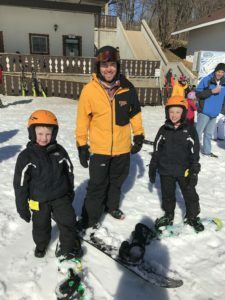 The Professional Ski Instructors of America and the American Association of Snowboard Instructors (PSIA-AASI) is the world’s largest organization dedicated to teaching people how to ski and snowboard. 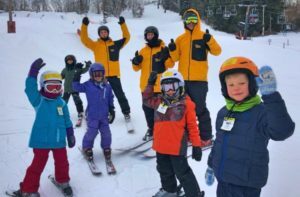 With over 30,000 members, PSIA-AASI establishes standards for snow sports instructors and develops education materials for instructor training. At Tyrol Basin, we have level 1, 2, and 3 certified professional instructors who pride themselves in teaching these nationally established standards. We also have instructors who specialize in children’s and freestyle instruction. Book a lesson with our pros today! This lesson is 1 on 1 with a professional instructor. Starting with your goals as the lesson foundation, our instructors will take you through a series of exercises and tasks to move you toward better turns, more stability, and more confidence. Whether you’re a “never-ever”, looking to improve your skill set, or seeking freestyle or race training, our instructors will take you to the next level in a private lesson. 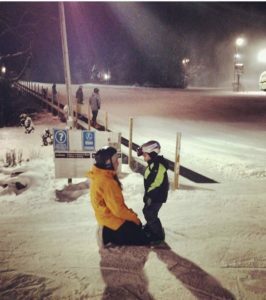 * Private lessons are not inclusive of a rental nor lift ticket. *If you would like to request a specific instructor or an instructor of a certain level of certification call Lyndsay at 608-437-4135 to set up your lesson! *Want to add a friend to your private lesson for a fun and relaxed learning environment? Make it a semi-private with up to four additional people for an additional $20/person! Visit Lessons to schedule now! Interested in purchasing multiple private lessons? We offer a “Lesson Buster Card” that gets you 5 private lessons for the price of 4! 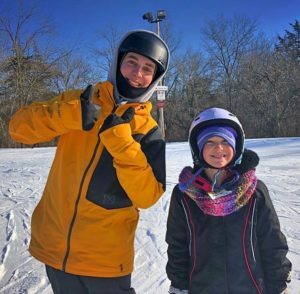 The “Lesson Buster Card” is simply a prepaid swipe card to use at your convenience–and it makes a great gift for someone looking to give skiing/snowboarding a try or improve their skill set with one-on-one private instruction! If your child requires special attention or struggles in group settings, a private lesson is recommended. Looking for a fun outing for your school, team, club, or business? We have special offers for groups of 10+! Looking to sign up for a single, one-hour group class? We offer group classes daily for both children and adults! Looking for a fun and exciting way for your child to try out skiing/snowboarding? Enroll in a single, one-hour group class today! This lesson is for children ages 3-6 and 7-12 of beginner to intermediate ski/snowboard ability level. Children are grouped by age and ability level upon reservation. Reservations are first-come first-serve and must be made 24 hours in advance, so don’t miss out! Call (608) 437-4135 to book your next reservation today! Interested in purchasing multiple group lessons for your child? We offer a “Lesson Buster Card” that gets you 5 group lessons for the price of 4! The “Lesson Buster Card” is simply a prepaid swipe card to use at your convenience–and it makes a great gift for someone looking to give skiing/snowboarding a try or improve their skill set with group instruction! Want to test the water before you make the plunge? Try a single, one-hour group class today! This lesson is for those ages 13+ of a beginner ski/snowboard level only. Reservations are first-come first-serve and must be made 24 hours in advance, so don’t miss out! Call (608) 437-4135 to book your next reservation today! This lesson is FREE with the purchase of any lift ticket! *Unsure of you or your child’s current ability level? Don’t sweat it! Call and talk to one of our staff members at (608) 437-4135 when you book your next lesson! All Participants must have a signed liability form prior to take a lesson. Want to join our team? Tyrol Basin is always looking for new ski and snowboard instructors who are passionate and eager to share their love of snow with others! If interested, please call Lyndsay at 608-437-4135.